Chinese President Xi Jinping arrived on Wednesday evening in Auckland, New Zealand, starting his state visit to the country. 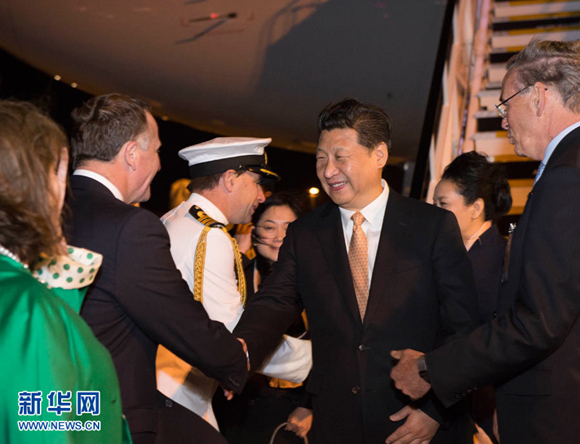 At the invitation of New Zealand Governor-General Jerry Mateparae and Prime Minister John Key, Xi began his first state visit to New Zealand after he took office as president last year. Upon his arrival, the Chinese president extended sincere greetings and good wishes to New Zealand people. Since the establishment of diplomatic ties 42 years ago, China-New Zealand relations have achieved leapfrog development, which brings great benefits to peoples of the two nations and makes contribution to the peace, stability and prosperity of the Asia-Pacific region, Xi said. Xi said he is looking forward to working with New Zealand leaders and people from all sectors during his visit, in a bid to chart a new blueprint for the future of the bilateral relationship. Following his state visit to Australia, New Zealand is the second leg of Xi's ongoing visit, which will also take him to Fiji.